In Bakersfield, California, the district attorney is going after a business that he says is preying on illegal aliens seeking to enter the United States, even though they have a criminal record. Bakersfield is only about 53 miles from the Mexican border, so there should be plenty of potential victims, right? Maybe, but in this case the "illegal aliens" are from Canada, roughly 1100 miles away. 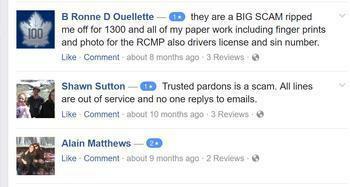 Southern California is actually quite popular with Canadians, at least in the winter, so there was plenty of business for something called Trusted Pardon Services, operated by Scotia Pardon and a few others. The company promised Canadians with criminal records that it could get the Department of Homeland Security to admit them to the United States, for a fee of $1,000 in most cases. But the complaint filed by the Kern County District Attorney says Pardon did next to nothing for most customers, refused to give refunds, and sometimes tried to charge a $200 cancellation fee. The complaint seeks $4.7 million in fines and penalties. This all has to do with a law that bans Canadian citizens convicted of certain crimes from entering the U.S. without a "waiver of inadmissibility" issued by DHS. The complaint says Pardon ran ads from 2009 through at least April 2016 on Facebook, Yelp, and other online sites. Prospective customers who filled out a form were promised that the entire application process would be complete within three months. “Many customers thus signed contracts without knowing what the contract said, and the process was so rushed and obfuscated by the sales staff that some customers did not even realize they had electronically signed a contract,” the complaint states, according to Courthouse News Service.